In the last meeting, Bluesocket described the various bandwidth management features on the white board. 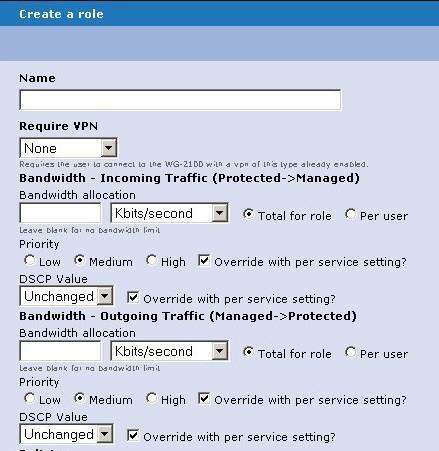 Below is a description of all of the features and also, we were asked how exactly we do bandwidth management. Bluesocket does traffic Policing which is also referred to as Rate limiting where the excess traffic above the configurable rate is simply dropped. restrictions, leave this field blank. users, then all users share the bandwidth up to 1 Mbps maximum. allocated 1 Mbps maximum, regardless of the number of users. not have a priority setting, the WG uses the priority setting in the role.